Russia vs. America: Which Army Has the Best 'Big Guns'? Who has the best artillery? Artillery has always been considered to be the primary killing force in ground combat. As the United States and Russia increase their defense budgets for the new cycle of military modernization, artillery systems are also being improved and revised. The newest American system is the 155mm M109A7, which is slated to slowly replace the M109A6 “Paladin” that forms the bulk of American self-propelled artillery. In the Russian Ground Forces, the Cold War vintage 152mm 2S3 is still in service, though it is flanked by the more modern 2S19 and its upgrades, the 2S19M1, 2S19M2 and 2S33. 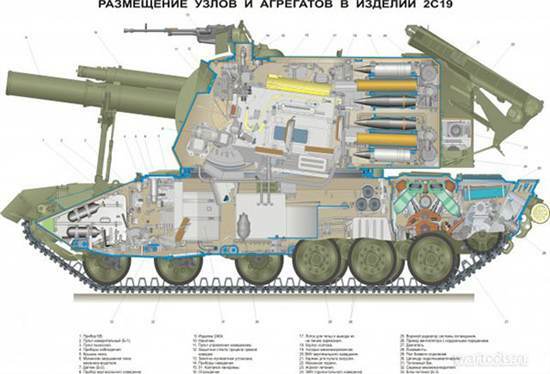 However, unlike the United States, Russia retains a significant light to medium self-propelled artillery component with the 122mm 2S1 and 120mm 2S34 systems. But how do these systems differ? What do the American systems do better than the Russian ones, and vice versa? The M109A6 Paladin is the backbone of American self-propelled artillery. As part of the long M109 line, it retains the same slow manually loaded gun, including the process of manually attaching a firing lanyard before shooting a round. As a result, the M109A6 is rated at a sustained fire rate of one round every three minutes. The primary improvements the M109A6 had over previous models was in battlefield networking and the ability to rapidly attain a firing solution after stopping, for effective “shoot and scoot” tactics. While reliable and accurate, in sheer firepower it is dwarfed by Russian, European and Asian systems. The M109A7 aims to rectify this situation. While in name it is another variant of the M109, the M109A7 actually uses a totally new chassis and turret. It has an automatic loader that improves the sustained rate to one round per minute, and can burst in up to four rounds per minute. It also features numerous enhancements to survivability and battlefield networking, and a modular armor package that improves survivability in COIN environments with additional belly armor. The oldest howitzer in Russian service is the 2S3 and its modernized variants. These are relatively simple manually loaded 152mm pieces. Modernization for the 2S3 has largely involved the installation of new fire control computers and navigation equipment without any real changes to armament. Being manually loaded, it has a rate of fire of around two to three rounds per minute. This is because it is considered an outdated design compared to the 2S19 Msta. The 2S19 Msta is the Russian Ground Forces’ premier self-propelled howitzer. Developed in 1988, it’s still a highly advanced design. Designed in conjunction with an armored ammo carrier, the 2S19 is capable of carrying fifty rounds, a significant increase over any M109 variant. They are stored in a high “tower” at the rear of the 2S19 turret, which then utilizes an autoloader to rapidly load the gun at a programmed sequence. With this system, the 2S19 attains a sustained rate of fire of around seven to eight rounds per minute. This is improved to ten rounds per minute in the 2S19M2 variant, developed and procured around 2012. The 2S19M2 also integrated GLONASS for improved accuracy and speed. The most recent variant, 2S33 attains even faster speeds. However, Russia also fields significant light self-propelled artillery capability. While most heavy howitzers listed above are divisional or brigade level assets, Russia also fields regimental level self-propelled howitzers with the 122mm 2S1 and 120mm 2S34 light self-propelled howitzers. The United States hasn’t produced a similar vehicle since the 105mm M108, which was phased out after the Vietnam War. The 2S1 provides a light, accurate, but short-ranged howitzer that still packs quite a punch. The 2S34 is simply a modernized version with a 120mm gun, that uses more modern projectiles derived from Russian 120mm mortar designs. The 2S34 also contains significant upgrades to electronics. The American military has made overtures to reclaiming this sort of light artillery capability with projects like the 105mm “Hawkeye” system, but such systems are not mature or combat proven, as the 2S1 is. Ammo choice is similar across all the howitzers. Both M109 variants can fire a full complement of base-bleed, laser-guided and standard ammunition. The same is true for the modernized 2S19s and 2S34. The Soviet Union made some use of laser-guided “Krasnopol” artillery during their war in Afghanistan. Ranges with base-bleed shells are roughly equivalent, despite the 2S19 using a longer forty-seven-caliber barrel relative to the 109’s thirty-nine-caliber barrel. Overall, the biggest differences between the howitzers comes down to rate of fire and battlefield integration. The U.S. Army has a far better integrated howitzer, but it shoots slower. Russians seem to prioritize firepower, with fast howitzers and more deeply integrated artillery. Each philosophy has validity, but it’s always easier to install or refresh a set of electronic equipment than to reengineer a main cannon.